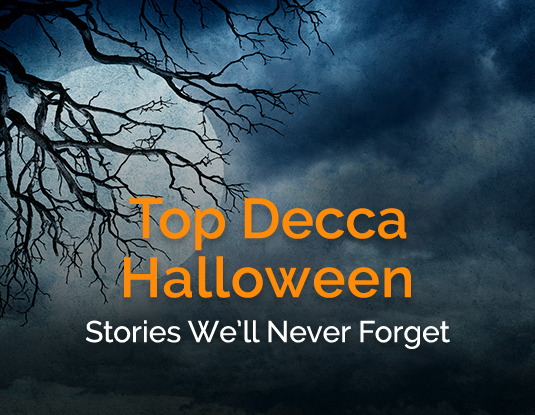 What better way to wrap up this month’s issue than with a few stories from the Decca staff? We polled the team for its most vivid recollections from Halloweens past. Frightening moments, fond memories, cool costumes, stuff like that. Then we shared them on the Decca Facebook page for our fans to vote on the top five. Here are the top-5 Halloween stories that resonated most with our friends and followers. To view all of the submissions, check out our Facebook Page. On Halloween when I was 10 years old, a boy was chasing me during recess and I slipped on the grass and broke my arm (due in part to my fancy 1980 wooden high heels). I was in emergency all afternoon and by the time I got home, I was not a happy camper, but still wanted to go Trick-or-Treating. 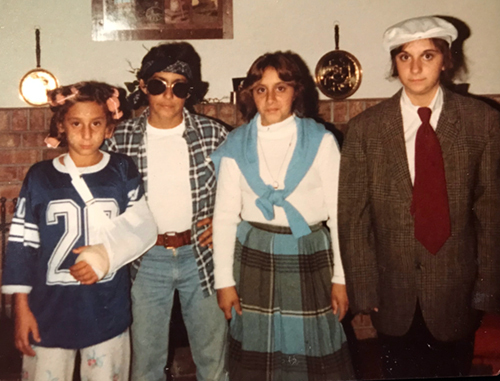 I didn’t have a costume, so I dressed up as a housewife – with a broken arm. I put on some Pajamas, rollers, and face cream and went out that night with my brother and sisters and had a great time. Whenever I think of Halloween, I always remember the broken arm incident, which could be one of the main reasons I’m not a huge fan of Halloween. My costumes growing up mostly consisted of Disney princesses, but one year I branched out and decided to be a bride because we came across this really cool (at the time) dress that was PERFECT for it. Apparently, the boy who had a crush on me found out…lo and behold guess who showed up wearing a tux. He stood up in front of the entire class, got down on one knee and proposed. 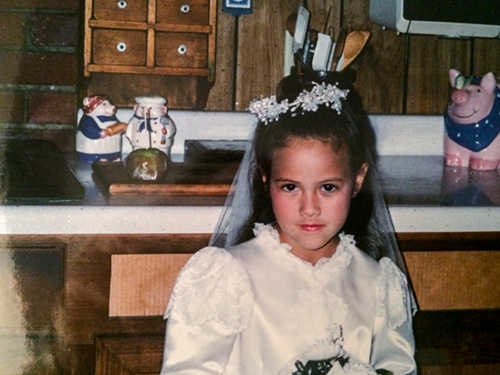 It was 1st grade so I was mortified, but it did make a lasting memory. My little sister and I are 5 years apart. We only got to share one Halloween at elementary school together before I went to middle school. 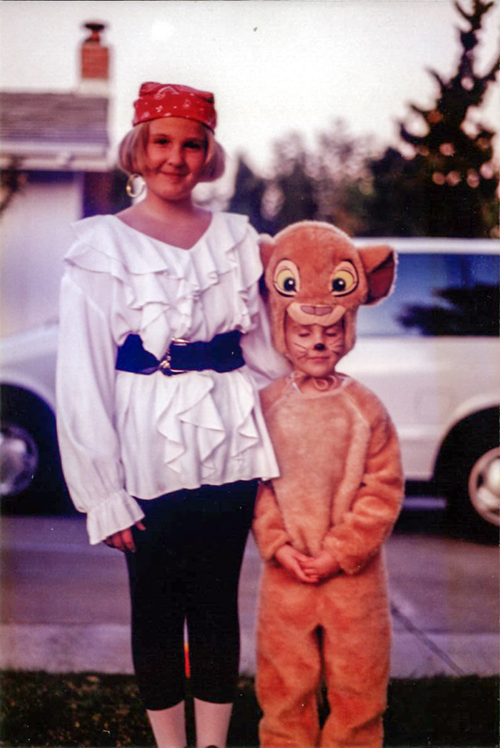 She was a 5-year-old with a vivid imagination, and was dedicated to giving us the most authentic Simba experience possible. She came right up to my friends scratched, growled, and even gave them a big lick on the arm. We still joke about it till this day. 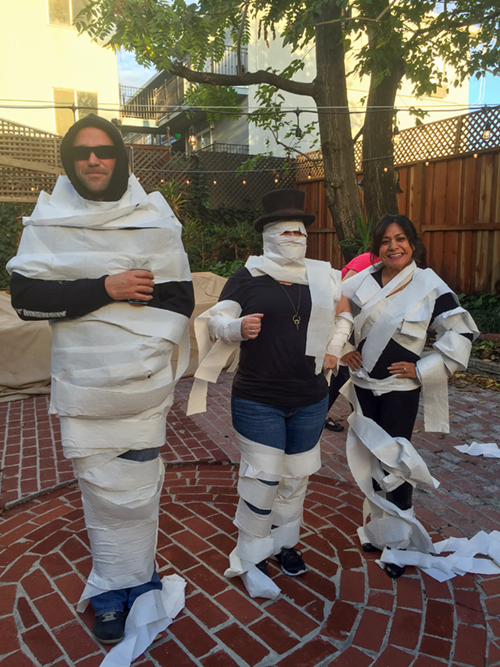 My most favorable Halloween memory would have to be when I won the best mummy contest for our Halloween work party. I’m not a big fan of Halloween, but I am a fan of beer. I didn’t have to dress up, everyone else did all the work, and I never once had to put down my beer. It was a success to say the least. In early Sept in 1995 and there was a huge controversy in the OJ Simpson Grand Jury testimony over a mysterious brown envelope which might change the course of the trial. 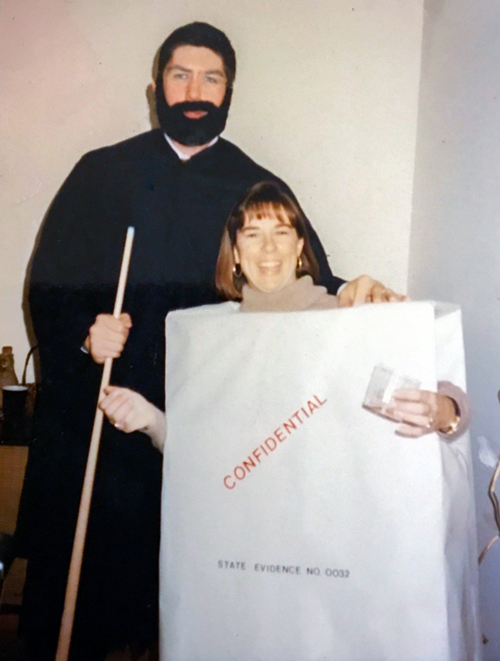 Because it was right before Halloween, we seized the moment and went to our party as Lance Ito and The Mysterious Brown Envelope.